Tuners are listed alphabetically by manufacturer and in alphabetical and numerical sequence by model number. In parentheses after the model number are the year of introduction and most recent list price, and/or the original list price if indicated by "orig" (special thanks to David Rich of The Audio Critic for copies of historical material from his reference library). Please see the On-Deck Circle for tuners that we know very little about or that we're not sure merit a writeup. We have posted updated eBay sale price data in this section through August, 2011; data for "as is" or damaged tuners, or otherwise unrepresentative auctions, may be excluded. There were three different versions of the FT-11 (not counting the two different faceplate colors) and we have not figured out all of their similarities and differences. The FM-only FT-11, like other Magnum Dynalab tuners, has an analog-style tuning knob but uses varactor tuning (the equivalent of 4 gangs) rather than a mechanical tuning capacitor, MD's typical minimalist styling and a large digital frequency readout. With a single IF bandwidth and only 2 ceramic filters, the FT-11 needs some help in the selectivity department. Bill Ammons' amplified filter board, which would convert the 2 filters into 4, would be one possible solution. Our panelist Jim listened to two versions of the FT-11 and has this report: "The earlier version had what looks to be the same audio stage as the FT-101 and 101A. 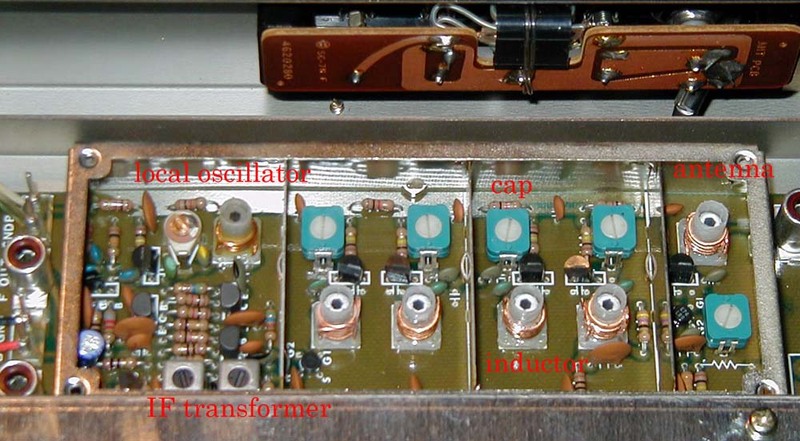 This includes the dated NE5532 op-amp. Both the FT-11 and FT-101 also use 4.7 µF output caps. It should not be surprising the the FT-11 sounds much like the FT-101 in stock form, with both having a rather recessed midrange. The bass isn't bad but there is a little too much treble. The ICs in the older version are an LM4500AM, the 5532 (which they painted over with red paint), and an LM1965N. The new version looks to get its audio from a larger IC. It uses the same LM1965N, but downstream there is a Philips TDA1578A chip instead. The newer version of the FT-11 has a vent on the top and much better-quality RCA output jacks, and is also sonically much more pleasant to listen to. The treble is just there without being in your face and the midrange gives a more realistic image between the speakers. In the photo, the old version has the blue board. You can see the 5322 op-amp to the right of the filters in the bottom right corner (the black square). There's a very straightforward mod that will really improve the sound: Replace the 5532 IC with a good bi-FET and put 5 µF or larger good coupling caps at the output." See how the two versions of the FT-11 sounded compared to other top tuners on our Shootouts page, and read our panelist David "A"'s Ricochet. The Stereo Club has a page on mods for the FT-11. The FT-11 usually sells for $125-200 on eBay, with a low of $109 in 8/11. The FM-only, black or silver-faced FT-101 has an analog-style tuning knob (despite using varactor tuning rather than a mechanical tuning capacitor) and a digital frequency readout. It has the electronic equivalent of 4 gangs and 3 ceramic filters. Several of our contributors praise the FT-101's sound and our contributor Ed Hanlon suggests that a modified FT-101 might be an ideal choice for an audiophile/DXer. Its sensitivity is terrific, on a par with the top Kenwoods (except the 600T/917), Sansuis and Pioneers, but like most tuners it can use a filter mod for maximum selectivity. See how one FT-101 sounded compared to other top tuners on our Shootouts page, and read our panelist David "A"'s Ricochet. The FT-101 usually sells for $300-400 on eBay. The first FT-101A was the virtually identical successor to the FT-101. There were at least five different versions of the FT-101A and four more versions of the upgraded "Etude" version (1990, $1,350-1,550 and a 24-carat gold faceplate version for $3,000), and we don't have much information about the internal similarities and differences among them. Externally, most FT-101As had black faceplates, but a silver-faced version also exists. Our contributor Ed Hanlon says the FM-only FT-101A "must be worked on to be appreciated. After a proper alignment, these tuners are VERY sensitive. The FT-101A uses 3 filters, 2 in wide and the third added in narrow. The latest 101A I saw had 180 kHz filters in position 1 and 2, and a 150 in position 3. Good for DXing maybe, but not for sound quality, so I used 280's in CF1 and CF2, then added a 3-filter amplified filter board in CF3, loaded with 150's. Wide bandwidth sound improved dramatically, and narrow bandwidth performance was improved as well. The FT-101A must have its output caps replaced for best sound. Later versions have an IEC jack already installed. The FT-101A is a wonderful all-around performer that sounds incredible after mods, and is perfect for the audiophile who wants DX performance as well." But another contributor is less than impressed by the FT-101A's build quality and parts selection: "I am really surprised there isn't a Chinese knockoff of the FT-101A kicking around. It could be very profitable for someone at a retail of say $300. The latest FT-101A has a few all-in-one Philips chips, one of those oscillator/mixer/IF amp specials, with an IF amp/demodulator following it. Basically the FM part of a $99 car radio/CD player for what, $1,400? It is pretty cheaply built, for what goes into it. I think those chips cost $1.30 each." Our contributor Todd compared an FT-101A to a Kenwood KT-5020: "The Magnum was a store demo unit bought 8 years ago and has never been aligned as the Kenwood has... [but] it has seen some mods, like Black Gates, HexFreds, case dampening, bypassing the op-amp and ERS paper around the transformer, so it really should be doing better than stock. I have done some standard audiophool things to the KT-5020 (clean connectors, dampen the thin chassis, mount transformer on o-rings) but nothing electrical, and I've got to tell you that in comparison, the FT-101A with the Signal Sleuth sounds much thinner, with less body on instruments. One could almost say 'Where did the drums and bass go?' The Kenwood's noise floor is quieter and has much better 'room feel'; with the FT-101A, the instruments sound like they are recorded in an anechoic chamber, with little reverb or depth. My comparison was done with headphones to be able to get down to the smaller details." And our contributor Ryan posted maybe his best rant yet, in our FMtuners group, when he tested a particularly poor specimen of an FT-101A. We don't know which of the many versions of the FT-101A he had. Our contributor Robert did some mods on an Etude: "I modified my FT-101A Etude tuner and found some things I had not read that may be of interest. First, it has an LM4500A as you describe; however, there is a dual op-amp on the high-gain output. It had the following numbers on it: 7558, SA 4385, and 8601 CM. I've searched all over and cannot find it, but after studying the circuit and making measurements, it is a dual op-amp, probably like a 4558. The most surprising finding was that the op-amp had a single-ended supply at +12VDC. Cheap design - not even a dual +/- supply! This created an obvious 5VDC offset for the high gain and a 2.5VDC offset for the low gain. DC is blocked by 13µF PP caps. It make me wonder how they could offer a balanced output with only a single-ended supply. It seems this lousy setup makes for more work in the long run. The lack of a bipolar power supply made me rethink any serious mods. However, I did replace the dual op-amp with a AD8620 that I placed on a BrownDog 8-DIP adapter. I also added a bypass 0.1 µF cap from +V to -V (now the ground in their single-ended supply) directly on the adapter. The gain of this section is 10k/3k, or about 12.7 dB. The low gain setting simply bypasses the dual op-amp. I did not replace the output caps and left all alone after simply replacing the dual op-amp. (The AD86x0 series runs at up to +/-13VDC; it is not spec'd for a single-ended supply, but it works just fine.) The sonics of the modified version are now smoother through the midrange than the stock Etude. In comparing this modified Etude to my stock Yamaha T-2, I think I prefer the overall tonality of the T-2." A basic FT-101A usually sells for $300-500 on eBay, with a high of $801 in 2/03. The Etude model usually sells for $400-600 on eBay, with a low of $343 in 4/09 and an all-time high of $909 in 8/03 for one with a gold faceplate. On our panelist Jim's Shootouts page, you can see how one FT-101A and one Etude sounded compared to other top tuners. Our panelist David "A"'s Ricochet has more on the FT-101 family. See how one example of the FM-only MD-108 sounded compared to other top tuners on our Shootouts page, and read our panelist David "A"'s Ricochet. A handful of MD-108s have sold for $2,281 to $4,200 over the past few years, with both extremes coming in 8/05. Marantz Tuners can be found on a separate page. McIntosh - See the Tube Tuners page for information on several McIntosh tube tuners. The MR 73 is fairly common and usually sells for $325-475 on eBay, with a low of $278 in 8/04 and occasional highs around $700. Former Stereophile reviewer Don Scott compared a modified MR 74 to a stock MR 78 and said: "I thought the MR 74 was better in oscillator stability (less drift) and every bit as good in selectivity and sensitivity. This was using just one Murata 110 kHz filter in place of the 230 kHz (?) filter they used. I would think that using two IF filters in series, and replacing the IF-amplification transistor on the little separate super-narrow IF board with one with more gain, would yield even better results. I think it would beat [the MR 78] hands down." 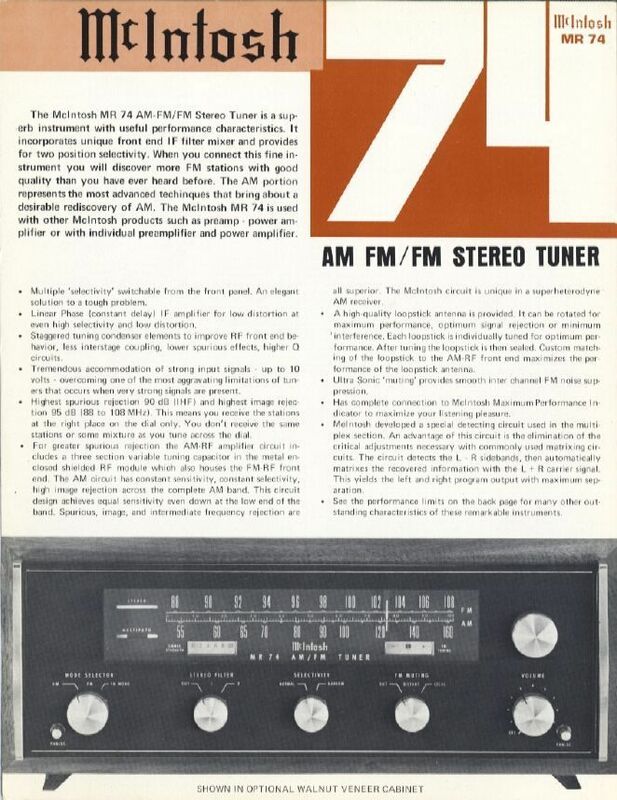 Our contributor John B. says, "The MR-74 has one of the best AM sections of any tuner I have owned, although that only applies if it has been modified by the addition of a 10 kHz whistle filter, which the stock unit lacks for some reason." Our contributor John L. points out that the MR 74 has variable selectivity for AM as well as FM. Our contributor Hank A. adds, "The MR 74 has wonderful sonics and is the quietest tuner I own" out of many top tuners. 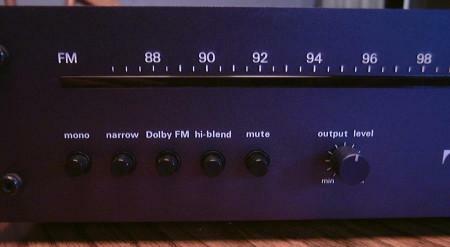 Our contributor Kent says, "The MR 74 is a much better tuner than any of the Magnum Dynalab units. The MR 74 is the best solid state tuner Mc built for sound quality. Excellent AM section, too. The RF performance of the MR 74 is excellent and the audio quality is superb. A best buy for your dollar. I am chief engineer of two NPR outlets in East Tennessee and we use MR 74 tuners as air monitors." But our contributor doug s. is not a fan, as can be seen from his comments about the MR 74 in the MR 77 writeup below. Our contributors Tim and Ann did a wonderful writeup of the MR 74 and other Macs in the Yahoo McIntosh Audio group, with a follow-up here. Tim also compares a modded MR 74 to a couple of other modded tuners on our Shootouts 2.0 page. See Roger Russell's site for more information. The MR 74 generally sells for $400-600 on eBay, but nice examples (particularly with wooden cabinets) can sell for $1,000 or more. The record high was $1,124 in 10/06 for a mint MR 74 with wooden cabinet and manual. Our contributors Tim and Ann discussed the MR 75 and other Macs in the Yahoo McIntosh Audio group. The MR 75 usually sells for $475-800 on eBay, but a "new" MR 75 went for $1,649 in 3/07. 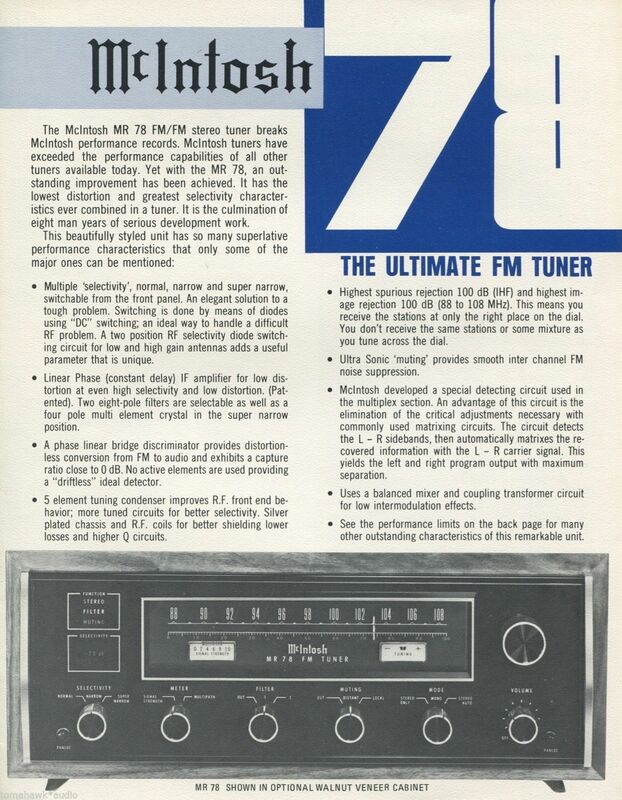 The FM-only MR 77 is not quite an MR 78, but maybe pretty close if the specs listed on Roger Russell's site are accurate (but we're not so sure that they are... see our FMtuners group for details). Our contributors Tim and Ann discussed the MR 77 and other Macs in the Yahoo McIntosh Audio group, with a follow-up here. Our contributor Brian L. says, "I've owned the MR 77 since new and it has gone up against some very good tuners and its sound has consistently been the winner. When I put it up against my Philips AH-6731, it was neck and neck for sound. Very close, with the Mac being slightly more smooth and preferred to the Philips." But our contributor doug s. says, "Different strokes for different folks. I owned a refurb'd MR 77 - acknowledged by Richard Modafferi, Mac's FM guru, to be the best sounding solid state Mac tuna extant. 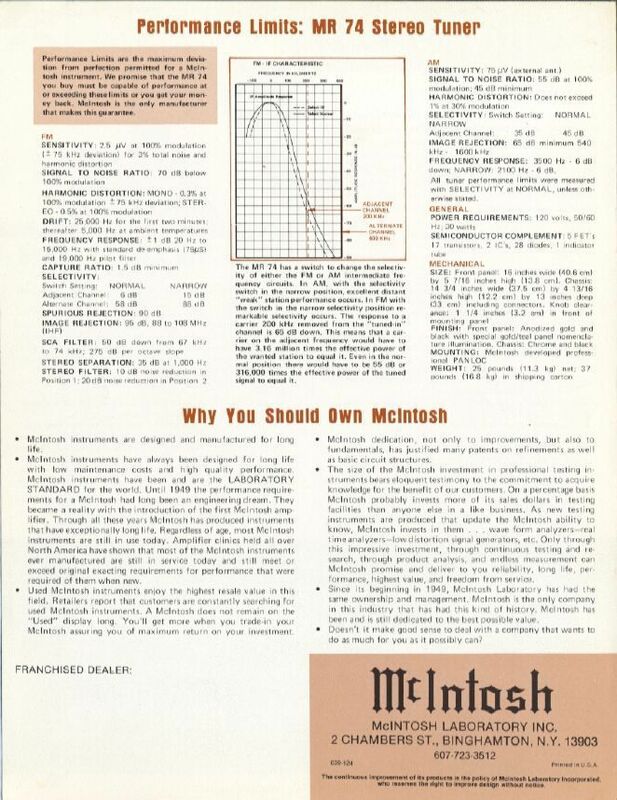 I also owned a mint MR 74 - other McIntosh tuna aficionados say *it* is the best sounding Mac s/s tuna. Of the more than 100 tunas I have owned over the past 20 years, I could count on one hand those that sounded so mediocre I could not live with them as an only tuna. Both the MR 74 and the MR 77 make this short list. The ones I owned were veiled, no soundstage width or depth, and were lacking in dynamics and frequency extension." Our contributor Walt says, "I have owned an MR 77 for the past 20 or so years. With a strong clear signal, it sounds very nice. Has the famous Rimo filters and IF design for low distortion. Looks great, as does all Mac gear. And the 6HU6 multipath indicator is a fun touch. However, maybe this is particular to my unit, but I have never been real happy with the RF performance (adjacent/alternate channel selectivity in particular). So if DXing is your game, you may want to pay the premium for the MR 78, which has three different selectivity levels." Here is an Audio magazine article written by Richard Modafferi, the designer of the MR 77, about Rimo filters. The MR 77 usually sells for $500-800 on eBay, with a low of $315 in 10/07 and a high of $1,275 in 3/06. 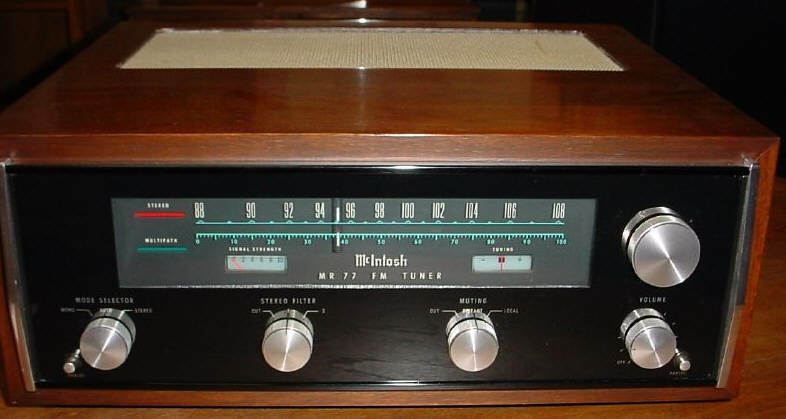 A wonderful classic analog FM-only tuner with great sensitivity and selectivity, the MR 78 was "the" tuner in some circles (including among DXers) in the '70s and still holds its own against newer tuners that sell for higher prices despite less solid construction (the Fanfare tuners come to mind). However, despite its fantastic selectivity, the MR 78 is no longer the premier tuner for DXers because its selectivity can now be matched or exceeded by a less expensive tuner modified with narrow ceramic filters. See Roger Russell's site for the specs. Our contributor David Rich notes, "The MR 78 is double-tuned at the input, then has a cascoded (better linearity) RF stage followed by another double-tuned filter." According to Terry DeWick, a top McIntosh repair tech, there were three successive versions of the MR 78 with the third one being the best, but we don't have any information on the differences. Here's our panelist Bob's detailed description of the MR 78's layout: "5-gang front end, implemented as follows: 2 gangs, followed by cascode RF power amp (Nch. JFET driving NPN bipolar), then 2 gangs, then balanced mixer (IC1, no common ID), then double-tuned IF transformer. Then the IF switching starts - at the super-narrow section, which uses a packaged crystal filter similar to a ceramic (connections are in-gnd-out). Normal and narrow bypasses it. Normal uses 4 double-tuned transformers, set up as 2 - amp - 2. Narrow adds 4 more double-tuned transformers, to makes the composite filter 4 - amp - 4. So the normal IF filter is 8 poles, and narrow adds 8 poles, for a total of 16 poles." Bob is not sure whether the MR 78's designers counted the double-tuned IF transformer at the mixer output as part of the normal filter, because it is not labeled as a filter on the block diagram; if it is counted, the normal IF filter would be said to have 10 poles. Our contributor Ed Hanlon suggests that an MR 78 be tuned up: "After mods, it's a top-flight performer. However, audiophiles have noticed that the very top frequencies sound like they're missing." Our contributor John Byrns points out that "there are at least two different versions of the MR 78 with different audio stages. The early MR 78s have no low-pass filtering before the outputs, while the later models add a pair of 'brick wall' three-inductor 15 kHz LPFs and a pair of buffer amplifiers." Our contributor Jov identified three different versions of the MR 78 when describing how to change the de-emphasis in our FMtuners group. Our contributors Tim and Ann discussed the MR 78 and other Macs in the Yahoo McIntosh Audio group. Here is an Audio magazine article written by Richard Modafferi, the designer of the MR 78, about Rimo filters. MR 78s with wooden cabinets usually sell for $800-1,000 or higher on eBay, while the $650-800 range is more likely sans cabinet, but prices are very dependent on condition -- cosmetically challenged pieces can sell for as little as $500 or so on eBay, while those in mint condition may sell for $1,100-1,200 or more. Highs were $1,675 for one with a wooden cabinet in 3/08, $1,599 for a mint one in 2/10, and $1,551 in 10/10. See how one MR 78 sounded compared to other top tuners on our Shootouts page, and read our panelist David "A"'s treatise on the MR 78 on the Ricochets page. Our contributor Charles posted a great review of the MR 78, and a worthwhile follow-up, in our FMtuners group. A final caution for eBay buyers: for a big, heavy piece, the MR 78 is very sensitive to being bumped during shipping, especially the front panel lamps. The MR 80 has an LED frequency display despite its analog tuning knob and mechanical tuning capacitor. Its digital readout in lieu of tuning and signal meters can be cumbersome for a DXer because it is difficult to determine where the edge of a channel is when detuning. (This should be less of a problem for non-DXers, who are more likely to tune stations with the MR 80's "lock" circuitry engaged.) The MR 80 has 4 presets that are like little separate tuners, and the tuning knob acts as a fifth preset. Some controls are located on the top of the tuner. The MR 80 has two IF settings, compared to the MR 78's three, but most of the comments above regarding the MR 78 apply to the MR 80 as well. Our panelist Bob says, "The MR 80 is clearly designed to a higher standard for difficult-signal reception, at least on paper. In the RF front end it uses the superbly overload-resistant 'cascade' amp design (as seen in the MR 78), but it has 5 varactor gangs. It has 2 gangs before the RF amp, which is the optimum configuration for strong out-of-band signal rejection. The mixer is balanced, using two JFET transistors, feeding the IF output transformer. In the IF it has a selector to engage a 'super narrow' quartz crystal filter, which then feeds the 'narrow' IF path. The narrow IF (the definition on the schematic, not mine)consists of 5 ceramic filters, 5 IF amps, and a limiter amp. If we take that literally, the MR 80 has super narrow and narrow modes, and no wide. After the diode type detector (both diodes point the same way on the schematic, Foster-Seeley type? ), the MPX circuit uses the LM-4500. There are separate L,R separation adjustments, followed by op-amp buffers, then 19 and 38 kHz notch filters, then a stage that appears to be an op-amp based low-pass filter, at least four poles. This is a complex and expensive implementation not usually seen except on 'statement' high-end tuners. "On paper, the MR 80 would not appear to be the best choice for an audiophile, due to lack of the Rimo low-distortion IF filter found in the MR 74, MR 77 and MR 78. That to me appears odd, especially with the care given to the sonics of the MR 80's MPX stage. Typically 5 ceramic filters do not yield the lowest distortion. Maybe it doesn't matter?" Bob adds, "All the ceramic filter stages are individually given the proper 330 ohm input and output impedance, which is the best way (many other tuners use two filters in a row, without a gain/buffer stage to separate them). But lacking in the MR 80 are the adjustments (cap and pot) seen in Yamaha tuners to dial in the lowest possible distortion from the ceramics." Our contributor John Byrns adds, "The MR 80 uses a belt and suspenders approach: it has both a post-detection filter and a TCA4500A MPX decoder chip with harmonic response suppression. The post-detection filter is a three-coil unit similar to the ones made by Toko and others; I believe the later MR 78s used a similar, or maybe even identical filter. I suspect that the filter is not just a simple 7-pole low-pass filter, but includes 'notches' to increase the rate of rolloff around the cutoff frequency. The name for that type of filter escapes me at the moment." See how one MR 80 sounded compared to other top tuners on our Shootouts page. Our panelist Eric found that one sample of the MR 80 sounded as good as or better than an MR 78, and the MR 80 even has slightly better specs (see Roger Russell's site). The MR 80 usually sells for $550-800 on eBay, but $900-1,000 or more is certainly possible. The record high was $1,992 in 5/05 when two newbies went berserk. Our contributor Owen R. compares an MR 500 to three top tuners on our Shootouts 2.0 page. The MR 500 usually sells for $300-400 on eBay. Our contributor Greg says, "The MR 7082 is basically an analog tuner with one IF bandwidth and a nice LED digital frequency display. The local oscillator and RF front end are tuned via varactors, so there's not a traditional mechanically ganged variable capacitor. (Therefore the front panel frequency knob is coupled to a potentiometer that controls the bias voltage on the varactors.) This arrangement is similar to some other tuners, such as the Magnum Dynalab FT-101A. The MR 7082 is a pleasure to tune around the FM band because, unlike digitally synthesized tuners that briefly mute during each new frequency setting), the MR 7082 tunes smoothly and continuously across the band. When connected to an outside antenna in 'the big city,' the MR 7082's RF performance is significantly better than the FT-101A's, because the FT-101A's front end produces such horrific amounts of RF intermod and crossmod in the presence of a full band of very strong FM broadcast signals. The MR 7082 is not so afflicted. Given only a single IF bandwidth (that's seemingly set a bit more for best fidelity, than for best selectivity), the MR 7082 wouldn't be the best tuner to receive weak signals in the presence of strong adjacents. The MR 78 is significantly better for that task. Regarding audio fidelity, to my ears the MR 7082 sounds clean but a bit on the 'thin' side. Many years ago I was going to look into that, to see what I could do - possibly increasing the value of some coupling capacitors or something? - to give its sound more 'body' and power. But I never got around to that project. I found that both an MR 71 and Modafferi-modded MR 78 sounded better than the MR 7082." The MR 7082 usually sells for $360-700 on eBay, with a low of $300 in 7/07 and all-time highs of $1,035 in 9/04 and $1,000 in 9/06. Our contributors Tim and Ann tell us that the MX 113 tuner-preamp has essentially the same tuner section as the MR 74, "but the MX 113's audio output is handled via completely different circuitry than in the MR 74. In the MR 74's design, after the signal leaves the MPX section, it is routed to a very simple output amp (remember the 'KISS' rule) [keep it simple, stupid - Editor] that amplifies the signal and sends it to both sets of outputs on the MR 74. The volume control on the MR 74 is completely passive in nature and only attenuates the signal from the output amp, which explains why the sound quality from both sets of outputs on the MR 74 is identical. In the MX 113, however, the phono preamp is utilized as the circuit that amplifies the FM signal output from the MPX section of the tuner. Additional signal processing takes place here in that the RIAA curve EQ is not applied to the signal from the MPX section AND the gain of the phono preamp has to be reduced from ~120 to 10 when it is handling the output from the MPX section. This output is sent to the Tape Out jacks and the preamp's line section. The end result is that FM on a stock MX 113 is not going to sound the same as FM on a stock MR 74 because of the additional complexity in how the FM signal is processed in the MX 113." Our panelist Ray says his MX 113 "came up a tad short" of the Pioneer TX-9800 and Hitachi FT-5500 MKII for sensitivity, and equaled the FT-5500MKII for overload rejection. The MX 113 usually sells for $350-550 on eBay, with a low of $315 in 12/07, a record high of $985 in 5/07, and a high of $760 in 4/11. According to Tim and Ann, the FM-only MX 114's tuner section is basically the same as the MR 74, but read the caveat in the MX 113 writeup above. The MX 113 usually sells for $300-510 on eBay. The MX 117 is a tuner-preamp that uses the same tuner as the Mac MR 75. Our panelist Bob offers this analysis: "The MX-117 has 5 analog gangs, a typical 4-pin MOSFET RF amp, and a MOSFET balanced mixer. Two of the gangs are before the RF amp (when the 'preselector' switch on back panel is engaged, which would likely make this tuner very flexible for both city dwellers and remote DXers. It has 4 ceramic filters with 4 gain stages, which is in no way an 'economy' design. All the ceramic filter stages are individually given the proper 330 ohm input and output impedance, which is the best way (many other tuners use two filters in a row, without a gain/buffer stage to separate them). But lacking in the MX 117 are the adjustments (cap and pot) seen in Yamaha tuners to dial in the lowest possible distortion from the ceramics. The MPX stage uses an unidentified chip, which directly drives a block identified as the 'MPX' filter, followed by an op-amp stage. This is more typical of what is seen in most other 'common' tuners." Our contributors Tim and Ann evaluated the MX 117 in our FMtuners group, and did a lengthy shootout with the MR 74 here. They conclude, "For sound, we think the MX 117 gives our MR 74 a real run for the money, and the MR 74 wins by a mere slight nose on sound quality. But, and this is a big but, if we needed to DX or listen to stations weaker than the ones we listen to, we'd happily use the MX 117 as our primary tuner as it is more sensitive than the MR 74. Our big beef with the MX 117/MR 75 is that this is when McIntosh dropped the ability to choose between wide and narrow selectivity in their tuner line, and all subsequent tuners they have designed and manufactured operate at a fixed selectivity. 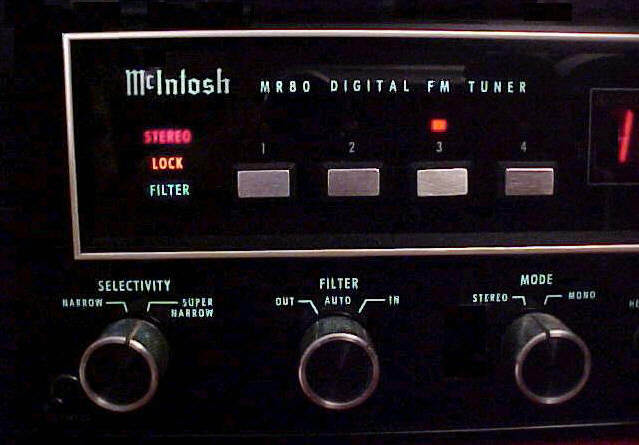 The MR 80 was the last tuner they made and designed that had adjustable selectivity. We hear a slight roll-off of the highs on our MX 117 that we do not hear on our MR 74 and this, and the very slightly more natural midrange reproduction we hear with the MR 74, is why we prefer the MR 74. But again, if we were signal-strength challenged, we'd happily choose the MX 117/MR 75." The MX 117 usually sells for $565-800 on eBay, with a low of $400 in 10/08 and record highs of $1,200 in 10/10 and $1,175 in 1/11. Our goal is eventually to list these AM-only tuners and antennas on our AM Tuners page. In the meantime, we're tracking eBay sale prices in the On-Deck Circle. MCS tuners were sold by J.C. Penney. Our research indicates that most low-end department store-brand electronics was made in no-name Asian factories and store employees would tell potential customers almost anything as part of the sales pitch. We've heard from a couple of sources that Matsushita (Panasonic/Technics) manufactured some MCS turntables, so there may be some truth to that. Still, we would steer clear of eBay sellers like "dennyone" who claim that Kenwood, Pioneer or another major company was the manufacturer of a given piece of MCS, LXI (Sears), or similar equipment. We would also suggest that no one pay more than $20 or so for a typical MCS tuner, but there are exceptions: those who are looking for a tuner with AM stereo capability might consider the MCS 3050 listed below, and the MCS 3700 and (presumably) the 3710 were made by NEC and might also be worth a try. The MCS 3050 is one of the few tuners with AM stereo capability. John Byrns says, "The AM reception of the MCS 3050 is better than the Carver TX-11a - it doesn't have the high noise level of the TX-11a. Unfortunately, the sound of the MCS 3050 is very gritty and sibilant on both AM and FM, while the sound of the TX-11a is undistorted save for the background hiss." The 3050 tunes in 10 kHz steps by pressing the up-down button, or by pretuning. The memory bank intermixes AM and FM stations, so preset 1 could be used for an FM station while preset 2 could be an AM station. The stereo light comes on for both FM stereo and AM stereo stations (AM takes about three seconds to lock in). The 3050 usually sells for $10-20 on eBay, with a low of $2.00 in 4/08 and a high of $52 in 9/07. 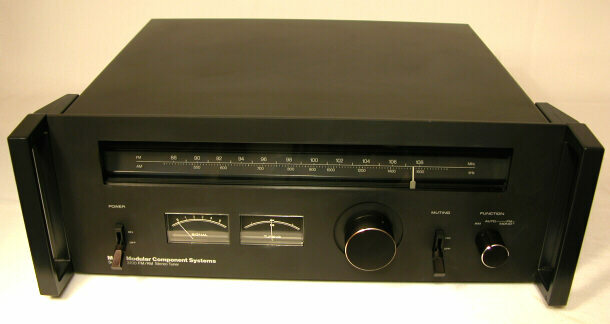 This fairly attractive-looking black tuner was the twin of the NEC Authentic Series AUT-7000E (photo). The MCS 3700 had a heavy gauge black matte-finish aluminum faceplate, metal chassis, solid metal knobs and smooth flywheel tuning system. There's also a 3701 (front, back, search eBay), that may be similar to the 3700. 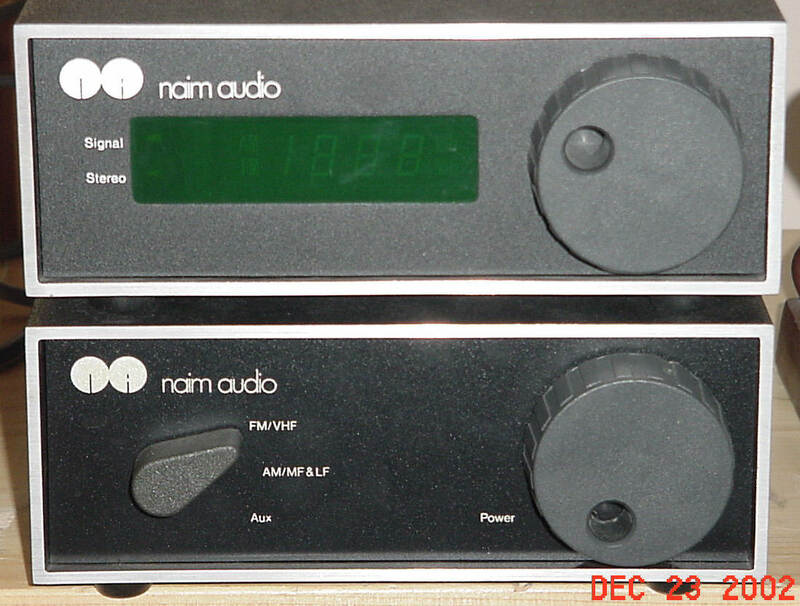 A 3701 and its matching amp sold for a total of $10 on eBay in 3/06, and $5-20 is typical for the tuner (the record low and high are $1.00 in 3/06 and $70 in 10/10, respectively). Our contributor Jeff H. reports that the apparently similar 3710 (photo, search eBay) has some features that the 3700 doesn't have, including variable level outputs that are adjustable with a front-panel control, multipath outputs and MPX filter. The 3700 and 3710 can be found for $15-50 on eBay, but one 3710 sold for $1.00 in 7/06 and one went for $83 in 5/06. We don't know anything about the 3705 (photo, search eBay), which is quite different from the others despite the similar model number and often sells for just $5-15 on eBay (with an 8/07 low sale price of $0.01, one penny, along with a $16 shipping charge); or the 3720, one of which sold for $40 in 3/06. Read our panelist Jim's review of the Model 104 and see how this scarce tuner sounded compared to other top tuners on our Shootouts page. The Model 104 usually sells for $280-405 on eBay. The Meridian 204 and 204 MK II are nicely built, artfully simple digital synthesizer tuners. We're going to assume that the two versions are similar internally until someone tells us otherwise. Here's our contributor Ray D.'s review of the 204: "The 204 is amazingly simple. It only gets complicated with the complete system/multi-room set up. Using the 204 for basic functions is extremely straightforward, but that simplicity hides a fair amount of sophistication as with most Meridian products. As the 204 was made to integrate with the complete Meridian multi-room system, there is a programmable timer function, though it is only for turning on at a particular time on a particular station, no off function. Nice bonus, anyway. There are 6 buttons for presets and two other buttons to shift these to two other banks for a total of 18 presets. The display can be shifted between frequency, preset number, time of day, timer setting, or signal strength on a scale of 0 to 15. The single set of up/down keys can be switched to either tune manually or search for the next station. The search threshold is adjustable so you can pick how strong a station has to be before the search stops on it. One nice touch is that when you power off from the front panel, the unit goes into standby and keeps the audio circuits warm so it will sound good right off the bat for the next session, no further warmup needed. You can choose whether the display goes blank or shows the time when in standby mode. Merely touching a preset button turns on the 204 and tunes that station. That is a detail I love about 'intelligent' components like Meridian or B&O - you tell them what you want to make happen and they do the necessary steps to make it so. Hardly a big deal, but using one for a while makes other components seem very 'dumb' in comparison. In terms of RF controls, there is only a mono button. No IF bandwidth, no blend. I wonder if like the Creek CAS3140 there are not some automatic circuits at work. I would expect that from Bob Stuart." Ray compared his 204 to some of his other tuners: "The 204 is a great tuner. On a good jazz recording, cymbals have to be heard to be believed. On my other tuners I would marvel at the detail when a good piece was played. Then I would switch to the 204 and hear new layers of detail in the detail! Scary. Up until now my Yamaha CT-1010 has had the most delicate and detailed highs of any tuner I've tried. The 204 is stronger elsewhere, fuller sound with more body, and then it beats the Yamaha on its best point. Weak points? It does not always sound great. Given how spectacular it sounds on good recordings/broadcasts, I guess it is just more revealing of transmission quality. I do feel on complex material it could be better and maybe it does not have a huge dynamic range. Of course maybe it is just not exaggerating. I will let other 204 owners weigh in there. I remember when Bob Stuart launched the 207 CD player. It was the first 'analog' sounding CD player to me. For years after that I always found he got digital more right than the competition. The 204 is a similar unit, far better than any other digital tuner I have heard. I have had a couple of others that were nice and smooth-sounding such as the Yamaha TX-900 and JVC FX-1100BK, but in comparison to the 204 they are soft and unfocused. This is unfair as a comparison given that the 204 was hugely expensive at the time. I think it was in the Revox price range. The more I listen to my 204, the more I like it. Very natural, great imaging, quiet and easy to use. Mine gives the best performance on [his sensitivity test] of the nearly 40 tuners I have tried." Read Ray's comparison of his 204 to a Creek 3140 in the writeup for the latter tuner. The Model 204 usually sells for $300-465 on eBay. The "Boothroyd Stuart Meridian 504" (as it says on the front panel) is a very well-built digital synthesizer tuner. Our panelist Jim opened up a 504 and reports: "Inside the heavy steel cage you see the main circuit board in the back left, the power supply and front display board in the right rear corner, and the transformer in the right front corner. They all do their jobs and were obviously located so as not to interfere with one another. To suppress noise between the boards, the designers used four ferrite beads at the input of the main board coming from the power supply with four more on the power supply board. An LM4500 multiplex chip is used with polypropylene caps in the de-emphasis circuit. The audio stage has two bi-FETs, an OPA 275 followed by an LF353. Four poly caps are here, too, and the main decoupling on this board consists of four Nichicon Muse electrolytics at 1000 µF 16 volt each. I see only two normal-looking ceramic filters. There are two filters marked Pilot Tone Left and Pilot Tone Right, and a third marked Birdy Filter. If this sounds like a tuner designed by a DIY team, you're right. That is what they do at Meridian and maybe one reason DIY has filtered down to us. One more thing, it sounds great." The Model 504 usually sells for $370-610 on eBay, with a ridiculous low of $112 in 11/06 and a record high of $995 in 8/07. See how the Model 504 sounded compared to other top tuners on our Shootouts page. There's a page on the 504 on Meridian's website. No one we know has ever seen this rare tuner, which the Orion Bluebook says was manufactured from 1993-1995. The only one we've seen on eBay sold for $615 in 7/11. Tuners branded MGA were made by Mitsubishi. There are writeups on the MGA DA-F200 and DA-F620 in the Mitsubishi section just below. The fairly common DA-C20 is a combination tuner/preamp that, despite the "20" in the model number, seems to be more similar to the DA-F10 than the DA-F20. The DA-C20 has 4 gangs and decent, but not exceptional, sound and selectivity, according to our contributor Ryan. The DA-C20 has two IF bandwidths, using linear-phase LC filters in the wide IF bandwidth mode and ceramic filters in narrow mode, like the DA-F20. A tuning lock circuit that will grab onto a nearby strong signal may make the DA-C20 a poor choice for DXers. Our contributor Tim, who worked for an audio dealer, says "When customers came in inquiring about the Marantz 2325, we showed them the Mitsubishi DA-C20 tuner/preamp coupled to either the Mitsubishi 70 wpc or 100 wpc amp. These two units would actually 'dock' together and it was a much better performing and sounding unit than the Marantz 2325 receiver. And we never had any come back for service." The DA-C20 usually sells for $125-265 on eBay, but as low as $50-60 is possible. The FM/AM DA-F10 has a 4-gang FM front end with a dual gate FET RF amp. Our panelist Bob says that the DA-F10 "is not just like a DA-F20 with meters - it's totally different inside, like the difference between a Sansui TU-717 and TU-919." Our contributor Bill Ammons reports: "At first glance the DA-F10 appears to have two IF strips - there is one IF strip that drives the H&V multipath scope outputs and the second is for the RF path. [There are two ceramic filters in each strip. - Editor] In the wide IF bandwidth mode it uses a 6-pole linear phase filter block, while in narrow mode there are 2 standard 230 kHz filters switched in before the 6-pole filter. The DA-F10 sounds great, and is fairly selective even in the wide IF bandwidth mode. This unit is very easy to get to the circuit board to do mods. I changed out the two 3-pin 230 kHz filters with new 150 kHz Muratas, and with the narrower filters this tuner is now within shooting distance of what the Carver TX-11a (stock) can do." Bill also makes some suggestions for audio section mods in our FMtuners group. Unfortunately, the DA-F10 has an overactive crystal lock like the Sansui TU-919, and a combined stereo/mono and muting on/off switch that prevents one from choosing to listen to weak signals in stereo (muting can be defeated only by switching to mono). The DA-F10 usually sells for anywhere from $80-180 on eBay, with a low of $32 in 2/08. Two "new in box" pieces went for shocking prices of $423 in 6/11 and $293 in 9/11. The DA-F20 is an unusual-looking FM-only tuner whose front panel resembles an automobile dashboard. It has a 5-gang traditional tuning capacitor front end, and crystal referenced tuning with digital LED readout. It also has a discrete output stage and decent ergonomics. The DA-F20 has two wholly independent IF paths, each with its own detector, with linear phase LC filters in the wide path and standard 3-pin ceramic filters in the narrow path. Wide/narrow switching is done by a front panel switch that selects which detector output feeds the stereo MPX circuit. Note that the DA-F20 has no blend or MPX filter. Our panelist Bob was able to easily mod the narrow filter path and install better filters in place of the original Toko filters, which were out of spec. After he replaced the narrow filters, it was necessary to retune the narrow detector. This, along with tweaking the RF front end, brought the tuner to fantastic working condition. Bob reports: "The DA-F20 is one of my top tuners. I like the tight bottom end and clean reproduction of brass and strings, and it's one of my most sensitive and quiet units in stereo mode. One of the things I like best about the DA-F20 is the ease of tuning, especially for an analog front end, digital LED readout unit. There is no complicated mechanism, simply 3 LEDs that let you glide through a station, and a lock indicator to let you know when it is dead-on. With numeric counter-type readout, wide-narrow filters, and separate mono-stereo and muting switches, this is a tuner that gets it right for usability." But Bob cautions, "The DA-F20 needs honing to make sure it's not trying to play your station while tuned in the weeds (i.e., 50 kHz off the channel center). Sometimes this means narrow filter replacement with matched filters to the existing wide LC filters. If your alignment guy cannot/does not do this, it has not been fully done. And not many can. It's expensive to keep thousands of sorted filters in stock. It's expensive to buy the equipment to sort them, and time-consuming to do it. After seeing four of these pass my test bench, all four got new filters - they really needed it." Our contributor Hank calls his DA-F20 "one of the most sensitive tuners I have. It can be bought and modded so inexpensively and made so good, it is virtually self-recommending. When the internal balun is removed, matched filters installed (or, even better, a Bill Ammons Filter-Adder board or two), improved capacitors in the audio circuits added, and (it goes with saying) a good alignment, this tuner becomes a great tuner." Our contributor Thrassyvoulos says, "My DA-F20 sounds and receives absolutely terrific and is very quiet, too. I would put it in my top 6 overall (along with the TU-9900, TU-919, Toshiba ST-910, Pioneer TX-9100 and Denon TU-850, and maybe Yamaha TX-2000), and about the same as far as sonics alone are concerned." Our contributor Thomas adds, "The DA-F20 stock is one of the best I've ever heard. It's really a miracle to me because Mitsubishi wasn't well-known as a tuner builder. The parts are of very good quality compared to its time companions (class of '78). Read the schematic diagram and you can see that there are a lot of widely recommended features like LC filter and ratio detector. The detector (wide) is discrete, as is the audio stage. The PSU is not bad at all. If you want to replace the coupling caps of the audio stage (which I recommend as a first modification), there will be enough space under the PCB." But while you're reading the schematic, heed our panelist Ray's cautionary note: "The schematic incorrectly depicts the output wiring from the PC board to the jacks. It shows the left channel output feeding the right channel jack and vice versa. The unit itself was correctly wired." See how one DA-F20 sounded compared to other top tuners on our Shootouts page, and read our panelist Jim's comparison of a stock DA-F20 to an aligned one on the Modified Tuner Report page. Our panelist JohnC's mods to the DA-F20 are on the DIY Mods page. Sale prices for the DA-F20 on eBay climbed after our review to over $400 in early 2006, but they gradually returned to the $175-250 range by 2008-2009 (where they remain). A "new in box" piece went for a surprising $570 in 9/11, and the record high was a bizarre $621 in 9/06. DO NOT OVERPAY; THIS IS NOT A RARE TUNER! Thanks to Bill Ammons for this technical analysis of the FM-only DA-F30: "The DA-F30 uses a small voltage-tuned RF front-end assembly. It looks to have a FET RF amp and bipolar mixer stage. The IF strip consists of a 280 kHz ceramic filter, followed by one-half of a LA1222 IF Amp IC driving a second 280 kHz ceramic filter and the second half of the LA1222. The LA1222 then feeds a third 280 kHz ceramic filter. In the WIDE IF mode the signal is routed to a HA11225 quad detector IC. In the NARROW IF mode, the signal is routed to one additional 280 kHz filter, plus an additional IF filter stage, which then feeds the HA11225 IC. The HA11225 detector then feeds a KB4437 stereo decoder IC. The stereo decoder IC then feeds the audio low-pass filter driver IC, which is a uPc4558. The de-emphasis pole is in the feedback network of the IC stage. The IC then drives an LC audio low-pass filter block. The filter block then drives the left and right output audio output stages which are emitter followers. Stereo separation is adjusted by cross coupling channels at the audio driver IC. The controller IC for the unit is a uPcD1704 IC. Suggested upgrades: Replace the uPc4558 with a bi-fet IC, TLO-72 or better; increase C125 and C126 to 33 µF; increase C160 to 33 µF; increase C172, C173, and C180-183 to 10 µF; replace CF101-103 with swept matched SFELA10M7FA0G 280 kHz ceramic filters; and replace CF-104 with a 230 kHz SFELA10M7GA0G filter." Our contributor Jov tells us that the DA-F30 "has 5 FM gangs with the following arrangement: 2 gang + 3SK45B RF AMP + 2 gang + 2SC535 Mixer + 1 gang for the unbuffered LO (local oscillator). Each gang uses a single varactor as opposed to the back-to-back arrangement found in better front ends. When I say unbuffered, it's the buffering between the LO output being fed to the mixer. Some front end designs have a buffer between the oscillator and the IF mixer, like in the Sansui TU-D99X/AMX/S77X front end." And our contributor Ray D. adds, "The filters used are three blue/red stripe SFE 10.7MX CMD and one brown/red dot E10.7S CMD. Features: 8 presets, tunes in .2 MHz increments, up/down tuning buttons, separate auto/manual tuning and stereo/mono, recording calibration tone, signal-strength or multipath 5 LED meter, muting on/off, wide/narrow IF and high blend. The last two functions are not fully automatic. The choices are Wide or Auto for the IF and Auto or Off for the high blend, so you can force Wide or turn off the high blend but you can't chose Narrow or switch on the blend as desired. The display has one party trick up its sleeve: The lighting is orange when there is no signal, white when receiving in mono and green for stereo." Our contributor George T. says, "The DA-F30's chassis is about as flimsy as I have ever seen, but it received real well with a folded dipole. But the real surprise is the sonics. It has a discrete output stage - kind of a novel circuit at that. The frequency extremes were there, but the mids were a little off and the top seemed too hot. I did a direct comparison to a modded and aligned Pioneer TX-9100 and preferred the smooth mellow sound from the TX-9100. But then I rebuilt the DA-F30's power supply and output stage with fresh high-quality parts. Now the sonics are a killer! The audio is close to my disc player and phono. The Pioneers had put the Kenwood in the closet. Now the DA-F30 is putting the Pioneers in a stack in the closet." In our FMtuners group, our panelist Ray said, "I highly doubt a DA-F30 could pull a signal like the F20." Our panelist JohnC replied, "I have both, and Ray is, as usual, absolutely correct. Also sonically, the F30 sounds OK but not in the same league as the F20." The DA-F30 usually sells for $35-65 on eBay, with a low of $20 in 10/09 and a record high of $122 in 7/10. Our panelist JohnC offers this tongue-in-cheek review: "The DA-F200 is a midsized black box that even in its diminutive size is still mostly air. It has 3 FM and 2 AM gangs in an analog tuning cap. It's a single bandwidth utilizing 2 IF filters, red with a yellow dot labeled CFS. The MPX IC is a R.Ohm BA1310. I believe that it MAY approach the sophistication of a Kenwood Basic T1 on a really good day. To categorize the sound would require a vivid audio memory of fingernails on a slate chalkboard, not to mention its uncanny ability to clearly identify any IBOC side channels in the general vicinity. This cornucopia of excellence is easily identified at first viewing of the tuner by the inclusion of the integrated interconnects soldered directly to the main board, not that there is actually more than one board inside the cavernous available space within the chassis. The power supply utilizes sophisticated 1/2 wave rectification, a single regulator (I think) and two whole filter caps." If you must buy a DA-F200 despite John's opinion, don't pay more than $10 or so for it. Thanks to Bill Ammons for this review of the DA-F620: "The DA-F620 is a 3-gang analog AM-FM tuner. The RF front end is a simple 2SK55 J-FET (not a MOS-FET) which is followed by a bipolar mixer. The IF chain consists of two 280 kHz filters with one bipolar gain stage. The FM detector is a KB4420B quad detector IC. This drives the KB4400 multiplex decoder IC. The multiplex decoder IC drives a bipolar output stage. There is no stereo separation control, hence expect about 40 dB stereo separation at most. The AM section is based on an HA1197 AM IC. There is an analog center tuning meter, and a 5-LED bar type signal level meter on the front panel. With a simple audio and stereo signal chain, only a few audio modifications are possible: C132-133, change 1 µF stock to 10 µF, and C164-165, change 0.47 µF stock to 10 µF. A 500 K 10 turn pot could be connected between pins 4 and 5 on the KB4400 IC to add a stereo separation control. For IF modifications: use an IF Filter Adder PCB where CF102 was. For best audio quality, use three SFELA10M7FA0G (280 kHz) filters. For better selectivity, use a 280 kHz FA0G filter to replace CF101 and two 230 kHz SFELA10M7GA0G filters in the IF Filter Adder PCB." 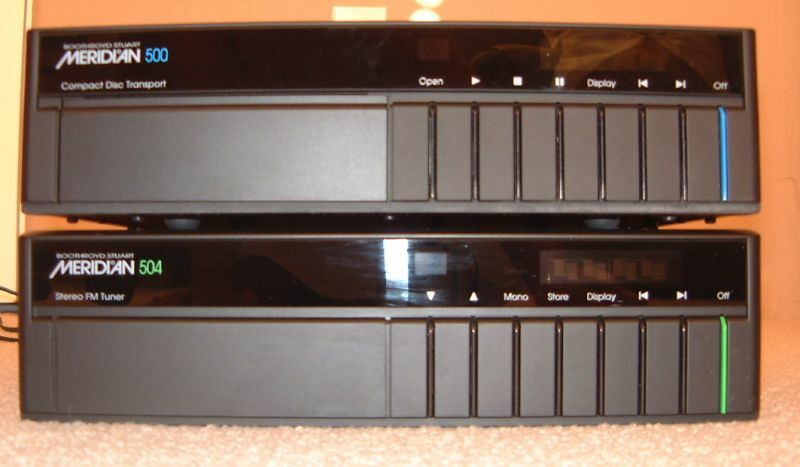 The DA-F620 usually sells for $20 or less on eBay. The Myryad Z130 is a sleek-looking black- or silver-faced British tuner that our panelist Eric found baffling to use without the owner's manual, which he didn't have because it was hiding in plain sight on the internet at the time he tested the tuner. The various front-panel displays next to the tuned frequency include "SI" followed by a number between 1 and 8, which seemed to show signal strength, and "SCH" or "SC 1-8" (when in station scan mode). Hitting the Select button brings up the CONTROL MENU where you can toggle through STN NAME, PRG TYPE, PRG TYPE SCH, TRAFFIC SCH, DISPLAY TIME, ALARM SET, ALARM ON/OFF, CLOCK SET and MEMORY CLR. The above are some unusual and interesting features, for someone with more patience to read the manual and figure out how to make them work, but this Z130 was not worth the effort from a performance standpoint. It had good quieting and sounded terrific on strong signals, or even weaker signals without any adjacent-channel interference, but selectivity was poor. The Mode button allows one to scan through strong signals or through 29 preset stations. Tuning is in .05 MHz increments; this permits good reception of a station on 87.75 (the Channel 6 frequency) that the Sony XDR-F1HD can't pull in because it tunes in .1 MHz increments and has excellent selectivity when tuned to 87.7 or 87.8. The Z130's sensitivity is decent so it might even be suitable for use in non-urban areas without strong adjacents. Although the front panel has an RDS logo in the lower right-hand corner, there was no sign of any RDS information on this example's display no matter which button was pushed, so this feature apparently wasn't working. The Z130 comes with a remote control when new, but this one's was absent. 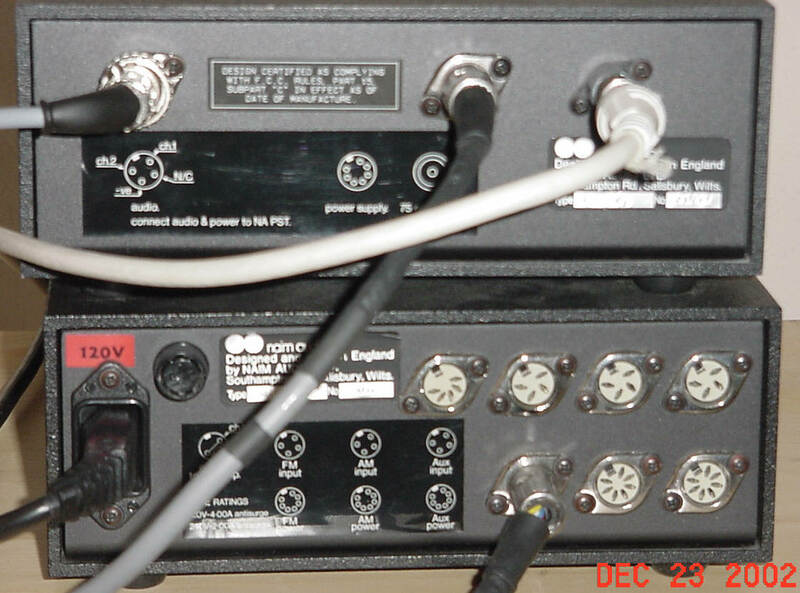 In addition to normal RCA outputs, the back panel has RCA jacks labeled "MYLINK IN/OUT" which allow connection of a proprietary cable to control the tuner along with other "Z-Series" components. Our contributor Mark R. says, "The 4020 came in three varieties: 4020, 4020A and 4020B. The 4020 was FM-only. The 4020B was produced during the same time as the 4150, providing an analog tuning alternative to those who had their doubts about digital tuning. 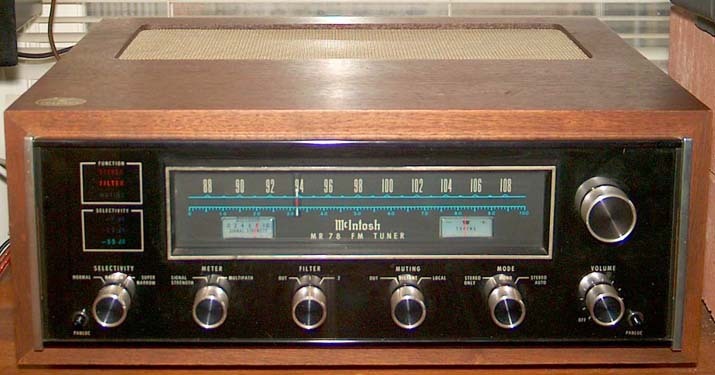 I have had a 7020 receiver for 30+ years, and the 4020 series uses the same tuner section. The FM tuner sounds pretty good, but I would rate its RF performance as slightly above average. It can be prone to front-end overload. Not that it matters much any more, but the AM section in these tuners is really an afterthought." We'll leave this one to our contributor "ilimzn": "This simple PLL tuner uses a Matsushita front end with the electronic equivalent of 4 gangs, offering good selectivity and decent image rejection - nothing spectacular for the latter but certainly excellent for the price! The tuning system provides 5 presets for each band, frequency, 'tuned' and centering indications. The IF uses matched ceramic filters with amplification in between and, while not cutting off the sidebands to utmost perfection (like some $1,000 tuners! ), it offers less distortion and better sound quality for the frequently overmodulated local stations. Although typically NAD no-frills (to the point of being nondescript), this tuner does have an interesting feature that is never seen on such a cheap device: dynamic FM hi-blend noise reduction. Unlike fixed FM blends, or those with steps, this system actually monitors the output signal for HF noise created by FM de-multiplexing and dynamically adjusts the amount of mono-to-stereo blending to cancel out the distortion. This useful feature is also defeatable, when you want to listen to the purest sound from a high signal station." Like most inexpensive digitals, the 4130 tunes in 200 kHz increments. Our panelist Bob adds that the 4130 has a single IF path and uses a quad detector, the LA3380 MPX chip, and an NJM 4023 dual op-amp per channel on the outputs. The ceramic filters are configured as follows: mixer, single-tuned IF t-x, JFET amp, CF1, LA1222 amp, CF2, LA1222 amp, CF3, LA1235 limiter/detector chip. The 4130 can usually be found for $20-50 on eBay, with a low of $1.00 in 10/08 and a high of $117 in 12/05. NAD claimed that the 4150's sensitivity "exceeded the theoretical limit," and one stereo magazine reviewer agreed, but our panelist Eric found that his used 4150 fell well short of that. Furthermore, selectivity was absolutely awful unmodified, although it improved markedly with narrow filters. Perhaps it was out of alignment? The 4150 and 4155 have digital tuning but only 5 presets. NAD claims that the 4150 was the first tuner to use Schotz noise reduction circuitry, while the 4155 used something they called the "FM Noise Reduction System." After reading Audio magazine's review of the Proton 440, our contributor Don W. said, "I drew up the circuit from the NAD 4155 and played around with it in a Spice circuit simulator. The noise reduction circuit is basically the same as the Proton 440's. The NAD 4155 circuit is a blend circuit, no doubt about that." Read our contributor Dave P.'s further comments on the Schotz circuit here. Like most NAD products, the 4150 and 4155 were good values when new and can still sound pretty good on strong signals. See how one 4155 sounded compared to many top tuners on our Shootouts page. DXer Mike Bugaj has a review of the 4155 on his website. Our contributor Sean found the sensitivity of the model 4125 (1985, $200, photo search eBay) to be the best of all his tuners. Our contributor John V. cautions that NAD tuners were apparently not built to stand up to rough handling in shipping. There are a ton of NAD tuners on eBay and many of them sell for under $100, so those who want one need not overpay. The 4155 usually sells for anywhere from $45-70, with a low of $26 in 8/11, and a mint one went for $235 in 11/05 before prices collapsed. The 4150 usually sells for $30-60, with a low of $15 in 11/10 and a high of $128 in 12/07. 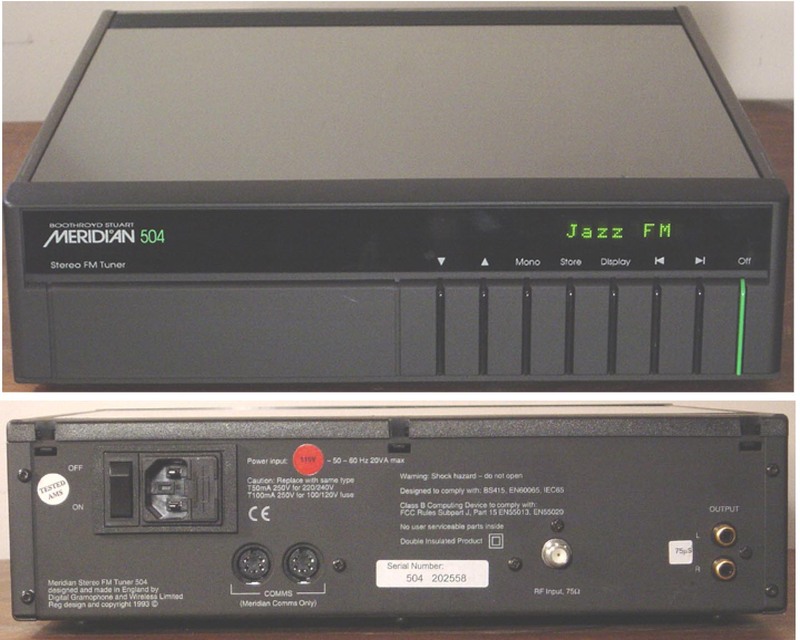 Our contributor Mark R. provides this review: "The NAD 4300 AM/FM tuner was part of NAD's top-end Monitor Series line in the late 1980s and early 1990s. I purchased my first 4300 in 1989 and still have it today. Immediately notable is the fact that this is a digitally tuned tuner with a tuning knob! Each twist of the knob tunes the unit in 50 kHz increments. There is a small flywheel within the tuner to give the tuning knob the requisite heft that one expects. The display is a five-digit display. A five-bar LED signal-strength display is immediately under the frequency readout. There are eight presets each for the AM and FM band. Tuner output is variable, with the level control on the back panel. "The tuner's performance specifications are ambitious, especially for sensitivity and selectivity. While I've never had it measured, I believe the tuner promises what it delivers, based on my 20+ years of experience with it. I bought a second 4300 on Audiogon a few years, and it has performed equally well. I have found three sets of performance specifications for this tuner - one set is found in sales brochures; the other two are in the service manual. One of those is for U.S. models while the other is for non-U.S. models. For example, mono sensitivity is specified at 9.0 dBf (brochures), 9.3 dBf (U.S. service manual), or 9.6 dBf (non-U.S.). Sensitivity at 50 dB quieting in stereo is specified at 34.0 dBf (brochures), 33.5 dBf (U.S.), or 34.5 dBf (non-U.S.). Stereo S/N ratio is specified at 80 dB (brochures), 78 dB (U.S.), or 77 dB (non-U.S.). I have no explanation for the differences among the three sets of specifications. "Documentation for the tuner states that it has a 'five-gang tuning system' including four stages of RF filtering. There are three IF-stage filters. FM bandwidth is selectable - in the Wide bandwidth mode, the sound is accurate and precise, and even in Narrow mode it still sounds quite good. There is also a dynamic blend circuit that NAD calls 'FM NR' which works by reducing the L-R component of the FM stereo signal, varying upon the signal strength of the station. Blending is never total; some separation is still retained for weak signals. The 'FM NR' circuit can be switched off when desired. The feature does remove significant amounts of noise, though, on very weak signals, it is quite apparent that separation has been reduced. The AM tuner is surprisingly sensitive, with more bandwidth and interference rejection than the typical AM tuner afterthought, but there appears to be a low-frequency roll-off. It's pleasant enough when listening to news or talk programs. "This tuner is ideal for challenging reception environments, such as fringe areas, and locations with severe blanketing problems, such as near multiple high-power FM transmitters. While the brochures for the tuner claim image rejection of 120 dB (110 dB in the service manual), my experience has been that additional RF filtering between the antenna and the tuner still helps tremendously in blocking out unwanted signals. The narrow bandwidth is extremely helpful in rejecting alternate-channel signals, at very little apparent cost to sonic quality. The 4300 is also great for DXing, both due to the performance and the ability to use a tuning knob rather than up-or-down buttons. I have noticed that the volume drops a little bit when switching from wide to narrow bandwidth, and the stereo soundstage can be affected slightly. But, even in not-so-difficult environments, the compromises are more than acceptable. That said, if sonic quality is more important to you than reception performance, this may not be the tuner for you. The tuner is clinically accurate; it won't cover up the flaws of a badly processed FM signal. But, on a clean, well-engineered station, the tuner's sonic performance is very good. It's listenable for hours at a time. "There's an important precondition: the tuner must be aligned for best results. Even a minor misalignment can result in a gritty, distorted sound, especially on aggressively modulated signals. There was a period in my life when I moved this tuner around frequently; those moves seemed to knock it out of alignment ever so slowly. There is also a small circuit board hosting the IF filters that came loose, generating additional noise within the tuner. That's been fixed. The moral of that story is to avoid moving this tuner around a lot. Overall, this is an ideal tuner for difficult reception locations, and an excellent one for all others, especially for receiving weak stations or a weaker station crowded between stronger ones. The RF performance -- sensitivity, alternate/adjacent channel selectivity, etc. -- is the best of any tuner NAD made. I have used the 4300 in all sorts of environments: in an urban area with and without an outdoor antenna, and in a rural area with an outdoor antenna, and found that if I could get any kind of signal at all, the tuner could make it listenable." DXer Mike Bugaj has a review of the 4155 on his website. The 4300 usually sells for $90-160 on eBay, with lows of $41 and $42 in 9/08 and a high of $325 in 1/04. The NAT-01 is a rare, ridiculously pricey, minimalist British tuner with a reputation for good sound. NAT 01s with the "NAPST" power supply have sold for $1,175-1,825 on eBay, and one NAT-01 sold for $2,600 in 2/05 as two morons chased each other up from $1,401. See what our panelist Jim thought of one particular NAT 01 on our Shootouts page. Beats us. Please post in our FMtuners group if you've ever used one. The NAT 02 usually sells for $820-1,200 on eBay, with a low of $511 in 8/09. We're stumped again. Please post in our FMtuners group if you've ever used one. The NAT 03 appears to be somewhat less rare than its siblings and usually sells for $400-600 on eBay. Our contributor Max reports from Italy: "I pick up invitation to comment on the NAT-05. I owned an Onkyo T-9090II, which I sold to a friend who wanted it. It was, as you all know well, very good, though sounding a bit too warm sometimes. I live in a not very difficult area, but neither it's a feast of reception. Then I was able to try a Kenwood L-01T: better in sound, I should say, than the Onkyo - somewhat brighter and more dynamic. Excellent in reception. But manual tuning each time, and having to correct it sometimes, no thanks... Then I bought the Naim, because I know the brand well and I had their gear already, and it was a bargain. Now the Naim has no regulations, but they kind of declare it as a line of thought: enjoy music the most, tweak the least. It catches stations perfectly, is very silent, easy to use, has a light and clear sound with good, articulated bass, is dynamic and has good looks - though this is my opinion only. Since I caught, in the review of the NAT-01, a glimpse of irony on the minimalism of the tuner, I say: mind you, the Naim have a reputation as good-sounding tuners, and they are." Our contributor Scott reluctantly replaced his NAT 05 with a Sony XDR-F1HD: "The Naim was great until KDFC 90.3 classical moved their transmitter. The Sony pulls in the signal and plays it in full stereo amazingly. The NAT 05 is the best tuner I have ever heard, still, but one must have a good signal. With a good signal it sounds better than the Sony, no doubt." The NAT 05 usually sells for $665-850 on eBay, with record highs of $1,200 and $1,202 in 8-9/06. 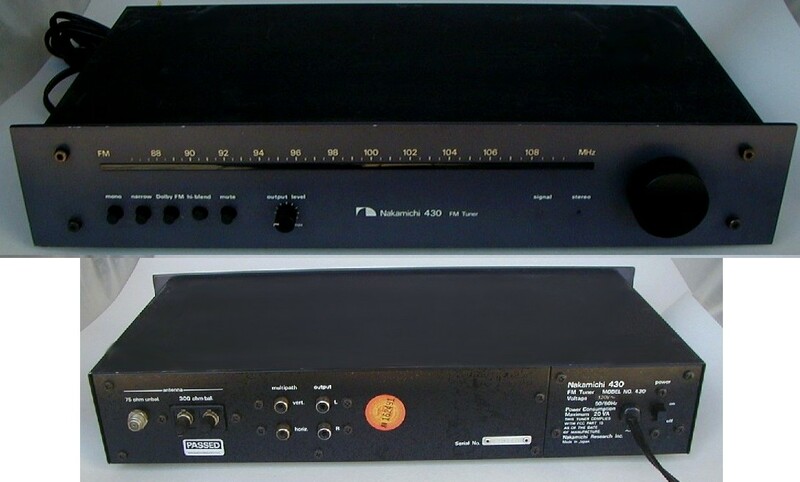 The FM-only 430, Nakamichi's only entry into the analog component tuner market (not including the 630 tuner-preamp), has 5 gangs and two IF bandwidths. The wide IF bandwidth is fully shielded on both sides of the circuit board, but appears to be made up of flat group delay LC filters. The narrow IF bandwidth uses 3 of the older style 4-pin ceramic filters. The front panel has pushbuttons for wide/narrow, stereo/mono, muting, high blend and output level, and the dial pointer has two lights on either side of the frequency indicator that indicate center tuning. The 430 is one of very few tuners that was available with Dolby FM built in, albeit at an additional cost. Our contributor Tom M. tells us, "The dealer would install a little PCB card if you bought it. The button is there on all of the units, but I do not know what it does if you did not purchase/install the Dolby option. This tuner is indeed a thing of beauty." Our contributor Ryan reports that the 430's build quality is among the very best that he's seen: "Nakamichi pulled off a packaging miracle with this tuner. Although the package is small, the power supply, tuning cap, IF strip, discriminator, and a few other things are all separately shielded. A lot of the circuitry is on plug-in riser cards and the wiring is terminated with Nomex style plugs. I can only think of a few other tuners that approached this level of build quality." Ryan also says that the 430 is one of the best-sounding vintage tuners that he has heard. The 430 usually sells for $115-175 on eBay, with a record low of $68 in 4/11 and a record high of $380 in 3/11. The ST-7 was a pricey black digital tuner with Schotz noise reduction circuitry. Our contributor Tom thinks it sounds great and owns two of them. Our contributor Bill T., on the other hand, sounds pretty convincing: "I think it's a neat-looking tuner, and I really wanted to like it. First, I thought the tuner was either misaligned or malfunctioning. I had it checked out and was advised that it worked just fine, so I thought it was just the fact that I resided in a low-lying area and that my reception just sucked. Then I picked up a Kyocera T-910, just to try it out. Well, the Kyocera had much better selectivity, it picked up more stations, and even sounded better than the ST-7. It also appeared to have been built better than the ST-7. The Kyocera, however, sounded somewhat thin and closed-in. I'm stubborn, though, so I acquired a second ST-7 in mint condition. Its performance was on par with the first unit. So, I put them both on eBay, and they were promptly snatched up. The people I sold them to absolutely love them. As they say, to each his (her) own. I suppose, however, that the ST-7 could be made to sound good, as long as you were no more than 10' away from the broadcast tower." See how one ST-7 sounded compared to many top tuners on our Shootouts page, but note our contributor Mark S.'s possible correction for Jim: "I noticed in the Shootout that the reviewer [Jim] stated that the ST-7 didn't have a wide-narrow setting but in fact it does. On the back panel of mine is a wide-narrow switch right next to the de-emphasis switch. Mine also has variable output limiters. Mine is a multi-voltage unit - could the difference be that [Jim's] sample was a 110V only unit and didn't have the extra adjustments, or did [Jim] just not notice them?" The ST-7 usually sells for $100-225 on eBay but prices are highly variable, with as low as $60-80 or as high as $300-350 both possible. Three crazy people ran one up to $460 in 11/05. The Japanese ST-70, as seen on k-nisi's website, was identical to the ST-7 cosmetically but we don't know about its circuitry. Thanks to our contributor Dave N. for this writeup: "The T-710 is a 4-gang, dual-gate front end MOSFET design, that features copper foil capacitors. That means that it still sounds like new, after 15 or so years, and is very quiet. The T-710 has wide/narrow bandwidths, separate mute/mono switching, fluorescent display, auto and manual tuning of .2 kHz, calibration tone and auto and preset channel scan. It has good sensitivity and selectivity, and outstanding sound, with notable bass, very good midrange and detailed treble. The T-710 is also remotable, with one of two compatible integrated amps--the A-610 and A-910. The [2-gang] AM section sounds pretty good." Dave adds a few more thoughts: "Nice ergonomics and build quality. Quiet as anything I've owned but the Sony JT-60. I'd say middling sensitivity/selectivity for this group. Easy to work on and top-notch parts quality." The specs include usable sensitivity of 10.8 dBf, S/N ratio of 78 dB stereo and 85 dB mono, image rejection ratio of 80 dB and IF rejection ratio of 100 dB. A T-710 sold for $41 on eBay in 3/11. Nikko: There are several Nikko tuners in our On-Deck Circle that we'd like to consider listing here if we can get some basic information on them. If you've used any of them, please post the details in our FMtuners group. The FAM-800 is a scarce, mostly unknown and unappreciated tuner that we thought has 5 FM gangs and 2 AM gangs. Since putting 5 gangs in an FM tuner usually indicates that the manufacturer was serious about performance, we put the FAM-800 up here in the hope that someone who owns one will tell us more about it. Our contributor Jeff responded: "It has only 4 FM gangs, not 5. At first glance it appears to be 5, but one 'gang' only has one set of fins. Performance is about on par with a stock Kenwood KT-6500. Anyway, the one that sold in 6/09 [for $35 on eBay - Editor] was mine, and I had put an LED strip behind the dial face, and replaced some caps in the power supply and output stage. It's not discrete output, it uses an obscure op-amp, the TA7129P. I only found one modern replacement, an NTE part." An FAM-800 sold for $75 on eBay in 10/10. The Gamma I is a 5-gang, FM-only, rack-mount style analog tuner that was sold in black and silver. It uses one LC filter and one "SAW" (surface acoustic wave) filter in the wide IF bandwidth mode, and 4 standard 3-pin ceramic filters in narrow mode, and has what some feel is a particularly effective high-blend circuit. Our panelist Bob says, "The Gamma I has been praised by two people I trust. It uses the HA11223W MPX chip, same as the Gamma V. Looks tough to mod, with one board above the other, but not impossible. Looks to be discrete outputs also." Our contributor Hank adds that the Gamma I has a "fundamentally sound design. I have not yet had mine modified but it has been restored (all marginal or suspicious parts replaced) and aligned. It is a very nice tuner and I suspect that it has significant potential for improvement." Our panelist JohnC did indeed improve his Gamma I, twice no less! Here's John's initial report: "These units sound pretty good as is, but they do respond well to simple mods. I did these without benefit of a schematic. The power supply is easy to get to just by removing the covers, so that got recapped. Bob said 'looks to be discrete outputs also,' which I read to mean discrete components, but there are definitely op-amps in there. To be specific, TA7136P ICs are used, the same as what are in the Sansui TU-9900. I did manage to identify the input and output caps to the op-amps and changed those out, but without a schematic I've stopped there for now. The IF strip is located on its own board located above the main board and prevents full access without removing it, not a simple task bet definitely doable. What was interesting was that this unit did not have the SAW filter installed in Wide mode. The LC was there but the SAW was replaced with a 3-legged ceramic Murata, tan body, yellow dot, marked E10.7A with the Murata logo and a stylized X on the next line. This appears to be a factory change because I can see no indications that the SAW was ever installed. Anybody else ever see this? Bottom line is that after a little tweaking these units sound real nice, reasonably selective and sensitive, at least in my market." But wait, there's more! John got hold of a service manual (now linked above) and went back inside. "The tuner has a 5-gang analog front end employing two MOSFETs which feed dedicated Wide/Narrow IF strips. The narrow strip employs 4 ceramic filters, blue body/red left color dot MM-A series, the Wide an LC filter and a SAW. I received this one with the SAW replaced with what I believe is a 175 kHz, tan body/yellow center dot CF with no other circuit changes noted. The IF feeds an HA11211 AM/FM system IC with only the FM side used. It feeds a TA7061AP IC and then into a ratio detector. The HA11211 does contain a quadrature detector but it is not used. The MPX IC is the venerable HA11223 out to TA7136P op-amps. 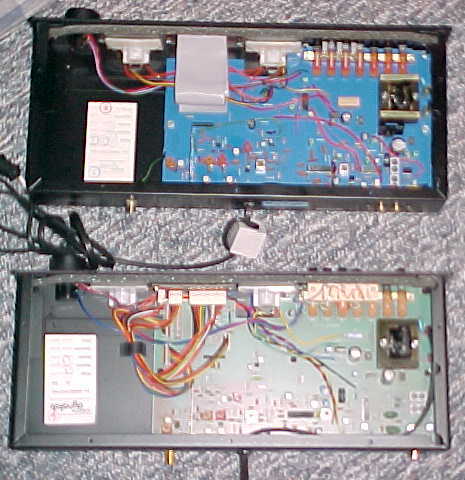 There are both fixed and variable outputs, with the variables running through about 28 inches of wire. The fixed RCAs are tied directly to board trace and are close to the op-amps. The power supply provides balanced 13V and single-sided 12V rails. The audio TA7136 op-amps are operated in balanced mode, while all other ICs are run single-sided. "Mods: Recapped the PS using FM or HE caps, whatever I had in the size I wanted. There are two Zeners in the PS, both of which were at the very limits of their spec. Replaced both with selected components against schematic nominals. Also added a Camille snubber after the power switch. B+ power distribution between the two boards IF (upper) and PS/MPX (lower) is handled by three wire-wrapped point-to-point connections which are very brittle and somewhat small (24AWG). I managed to break three just in completing the mods. On top of that, when you follow the schematic you will find that the single wire at pin 11 supplies power to both the wide and narrow IF strips, the tuner system IC (HA1211), the detector, AND the front end through pin 8. At which point my Audio Nervosa kicked in and I decided to replace all of the B+ wires, pin 10, 11 and 16, and soldered pin 8. "Rebuilt the detector using Dale RN60 resistors and a Nichi KZ cap, rebalanced the detector after replacement. Replaced the decoupling caps with Panasonic FMs and audio caps with a mix of manufacturers from BlackGate to ELNA SilMicIIs. There are two .47 µF (C320/321) caps on the input side of the op-amps which I was hoping to update to 1 µF films, but I couldn't figure out how to fit them in between the two boards so I settled on some 1 µF BlackGate Ns from my dwindling stash. Pulled the wiring and four mylars out of the de-emphasis circuit, replaced the four Mylars with two selected polypropylenes of the correct size. Added a Bruce Carter RF grunge filter across the MPX IC HA11223 power legs, pins 1 and 7, paralleled 0.1 µF, 0.01 µF, 1000 pF NPO/COG, 33 pF NPO/COG. "There's pictures of everything in our FMtuners group. As for how is sounds... this is one of a handful of tuners I have where the speakers dissolve into nothing, and all you hear is the performance space. Bass is tight, deep and on par with the best I've heard. Midrange is very nice, high are extended, non-fatiguing and sweet. Definitely NOT bright. Nice depth to the soundstage, even betters a Mitsubishi DA-F20. Fairly quiet, not the best but far from the worst. Until you really add a lot of gain it's imperceptible, at least to these old ears. It still needs an alignment but I believe that it must be fairly close. Dial indication is spot-on and linear, with station lock balanced on either side of the tuning meter. I definitely had fun with this one -- it took to the updates really well. If I were to do another I would make sure I had all the parts before I pulled the IF board, because removing it once is more than enough. Did I mention how good this thing sounds??" Our contributor Ed V. says, "There are four versions of the Gamma I; the W version is for 120 volts AC operation, others for 220/240 volts AC. It is kind of a sleeper -- quite good reception. As far as mods (or repair) are concerned, it is a bit troublesome to work on, requiring unsoldering wire wrap connections to get at the audio output and the low-pass filters module in same. The audio outputs are driven by an IC preamp, a TA7136P, one in each channel. Each TA7136P is followed by a decoupling cap, a reed relay muting switch and resistors to ground to provide the variable and fixed audio outputs. The fixed output uses two 4.7 K ohm series resistors to reduce the audio level. The variable output comes from a 10 K ohm potentiometer." Our contributor Ryan cautions, "At least some of these have gotten really screwed up with age. Bob and I both had big problems with ours in wide mode that resulted in poorer wide-mode performance than in narrow. I blamed in on the SAW filter not matching the other filter. One of our contacts in Germany (where SAWs were much more common) noted that SAWs can sometimes degrade over time and become unpredictable. I have no knowledge of the correctness of this, but I did later take in another Gamma I for alignment that aligned perfectly and behaved as expected. Thus, it's another unit with high variability that cannot necessarily be brought into proper working order if it's off. A good cautionary note for anyone, and a good reason not to pay too much unless it has been measured, aligned, and THOROUGHLY checked out. Incidentally, narrow-mode matching and performance has been superb among all three known measured units." Ryan adds, "It seems to be missing a stereo threshold adjustment though, which is weird. Separate wide/narrow separation adjusts, however. MPX chip seems to run the outputs directly." The Gamma I usually sells for $40-90 on eBay, with a record low of $30 in 5/09 and a bizarre high of $318 in 12/07 as two noobs ran it up from $61. In the wake of that debacle, another Gamma I went for $179 in 12/07. The Gamma V is a very sensitive and selective FM-only rack-mount style digital tuner. It is a better DX performer in stock form than most digitals we've tested, with the equivalent of 6 gangs, but the Gamma V also sounds terrific with particularly good bass. It uses one linear phase LC filter block in wide mode and adds two more in narrow, both of which are adjustable for best linearity (but because it uses no ceramic filters, it is not suitable for filter modification). There are also dual transformers for powering the digital and analog section to prevent corruption of the analog power supply. Construction is all frame and beam with heavy shielding around the front end and digital control sections, with beams running from the front to the back of the tuner to further isolate noise-producing circuitry from the audio circuitry. Fixed, variable, and scope outputs are provided on the rear panel. Our contributor Ryan aligned and analyzed a Gamma V and provides the following commentary: "When this tuner is fully aligned, it can be better than any stock tuner I have ever heard. The sound is superb from top to bottom, and the measurements back it up. Spectral analysis showed that IM distortion was essentially nonexistent, THD at any frequency over 1 kHz was at .009% or under, and separation was 60 dB out to 10 kHz. In my experience, this just does not happen with almost any stock tuner at any price. I attribute this in large part to the superbly linear IF strip that seems to pay good attention to group delay characteristics, and good ratio detector coupled with the HA11223W multiplex. But do keep in mind that the Gamma V is two [now four - Editor] decades old, and without alignment you will not get these results, and because of the LC filters, it is no ultra-selective DXer. And like many vintage tuners, birdies can be a problem on stations loaded with SCA subcarriers." Our contributor Bill T. also gives the Gamma V a rave review: "It's digitally synthesized, has only 6 presets, and has a search feature that is fairly primitive. Instead of a tuning knob, it has an up/down rocker switch that's large enough to operate with your elbows. Now the good stuff: the Gamma V is probably one of the best stock FM tuners out there. Build quality on this sucker is outstanding. Nikko didn't skimp on parts with this baby. 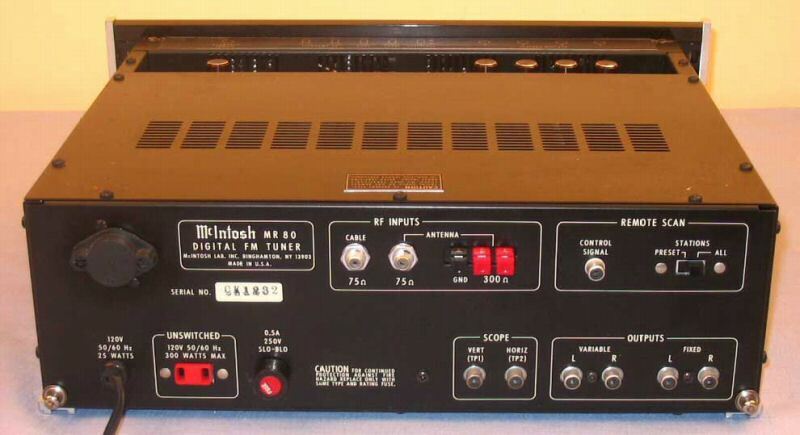 I have not seen another '70s or '80s digital tuner built this well for less than $1,700-2,000. It appears to have better sensitivity than my unmodified Kenwood 600T, and the Gamma's selectivity is much better. The Gamma's sound stage is a little flatter than what you will hear with the best tuners. However, width and depth are easily the equal of the best digital tuners I have heard. The frequency response seems to be more extended in the upper range than the 600T (I like the sound of the Kenwood, but the highs tend to be a little soft and rounded-off)." Our contributor Hank calls the Gamma V "a very sensitive tuner with superb sonics and first-rate build quality. Though not *quite* the DX machine that some of the other tuners are, this is nevertheless one of my favorites." And our contributor Bill C. gave the Gamma V's bass the nod over that of his Yamaha T-85 and JVC FX-1100BK. See how one Gamma V sounded compared to other top tuners on our Shootouts page, and read our panelist David "A"'s Ricochet. The Gamma V usually sells for $120-200 on eBay, with a low of $51 in 9/10 and a wacky high of $463 in 4/07 as two nutjobs ran it up from $250. The NT-850 has 4 gangs and 5 IF filters (although strangely, in our contributor Ryan's sample, one of the filter slots was left empty). Ryan tells us that the NT-850's user interface is very good, with separate switches for IF Band, Hi-Blend, Multipath and Muting, a selector knob for mono or stereo, and a knob for output level. The most interesting of these is the multipath button, which allows the user to hear the multipath component of the signal being received. Ryan explains: "I haven't seen this feature anywhere else. Normally, one can gauge multipath by hooking the multipath output up to an input on the preamp. Unfortunately, this is rather cumbersome and takes an extra input on your preamp, and even then is only one channel. The NT-850 gives you a button that does pretty much the same thing." Ryan also reports that the NT-850 should be easy to mod because the removable bottom panel allows access to the bottom of the circuit board. The NT-850 usually sells for $25-60 on eBay but a "new" one went for $153 in 3/06.